I’ve always wondered if Michael Nesmith’s tenure with the Monkees was a factor in his solo career failing to take off in a big way. Post-Monkees, his brand of toe-tapping country-rock resulted in two Top 40 singles hits, but his albums didn’t even come close to cracking the Top 100. The music deserved better. Nesmith finally brought a scaled-down version of the show to Seattle, this past January 17. No band, just Nesmith on acoustic guitar, and Pete Finney on pedal steel guitar. While billed as featuring songs from his first proper solo album (credited to himself and not a band), And the Hits Just Keep on Comin’, the show also included songs from the First National Band albums, and a nod or two to the Monkees. 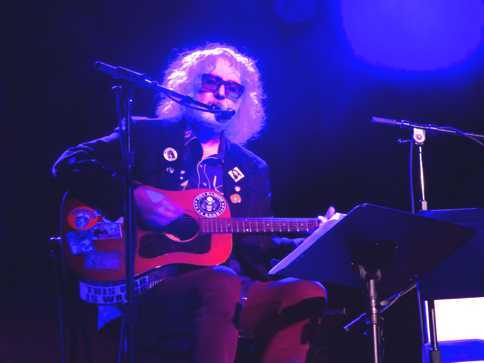 First up was a set by Scott McCaughey (Young Fresh Fellows, the Minus 5, R.E.M. ), who was charmingly self-deprecating throughout. “You guys are in for a real treat!” he announced as he arrived on stage, pausing before adding, “and I’m not talking about my set,” to good-natured laughter. 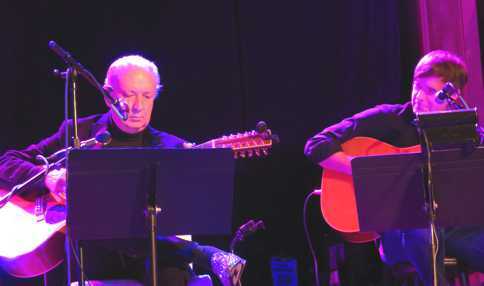 Accompanying himself on acoustic guitar, McCaughey sang a song inspired by The Walking Dead, the very apt “Davy Always Gets the Girl” from the Minus 5’s Of Monkees and Men, and invited the audience to sing along to his cover of the Beatles’ “Nowhere Man” (“Now be honest; that’s the best version of that song you ever heard,” he cracked afterwards). It was hard to believe that it’s just over a year since McCaughey had a stroke. He credited Peter Buck’s bringing Beatles music for him to listen to while in the hospital as really helping his recovery; unsurprisingly, the stream-of-consciousness number he wrote while in the hospital also namechecked the Fab Four (look for an album later this year). Though Nesmith seemed a little befuddled during his own set (before playing “Joanne” he asked, “We didn’t already sing this, did we?”), he was also clearly excited by the enthusiasm in the house, gushing, “I’m so thrilled that anybody knows my songs!” Since the songs on the And the Hits… album were solely performed by Nesmith and O.J. “Red” Rhodes on pedal steel guitar, the live performances largely matched the studio arrangements. The differences were more apparent in a song like “Propinquity,” which Nesmith recorded with both the Monkees and the First National Band. Not to mention “Different Drum,” which most people probably know through the hit version by the Stone Poneys (featuring a pre-solo stardom Linda Ronstadt). But the song was written by Nesmith, and he recorded his own slower, more countrified version for And the Hits, and chose it to open his encore at the Seattle show. The Monkees’ “Papa Gene’s Blues” was similarly slowed down and countrified, and featured guest vocalist/guitarist Ben Gibbard (“Gibbon — Gibboard? What is your last name?” said Nesmith) of Death Cab for Cutie and the Postal Service. Gibbard also joined in on “Joanne,” “Keep On,” and “The Crippled Lion,” which featured Gibbard on lead, as, in Nesmith’s observation, “Ben sings this a lot better than I do.” Gibbard jokingly agreed. “The Candidate” was another highlight, with lyrics like “The patience of the people soon will end/Time will tell/As the melting of your plastic smile begins,” as relevant today as they were 47 years ago, when the song was first released. Nesmith was chatty during the set. 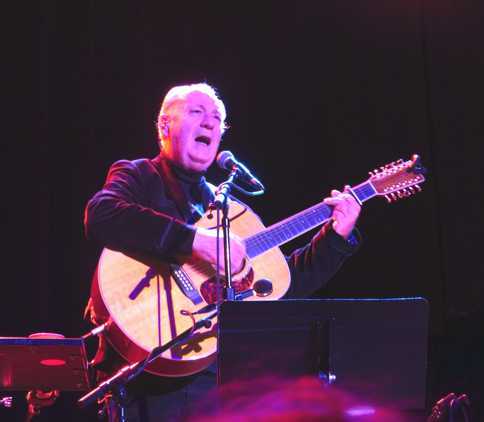 Perhaps due to the fact that it was the first night of the current tour, he stated, “Pete has just learned this stuff, so no wisecracking!” in reference to his on-stage partner, though Finney’s performance revealed no apparent difficulties; indeed, he was able to add improvisational grace notes on his pedal steel during Nesmith’s stories. In another anecdote Nesmith said he introduced his First National Band member Red Rhodes to the joys of marijuana by having him mix it in his peanut butter (“Magic Jif”), because Rhodes had said that smoking it irritated his throat. The weed-savvy Seattle crowd was skeptical about how well that would work; you have to bake marijuana to feel its effects. But it was part and parcel of a relaxed evening that felt like you were kicking back with an old friend. When a man shouted out that Nesmith could stick around and play all night if he wanted, it was clear that nothing would’ve made the audience happier.